Today we are Seeing Beautiful in honor of Sugar the Golden Retriever, who gave us lots of golden joy as she sought beauty everywhere. And in Mommas to love!! 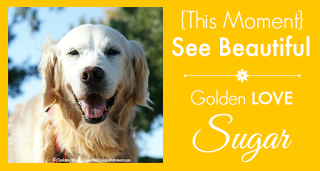 Thank you, Sugar, for always helping us see golden beauty everywhere! You do have lots of beautiful to see thank you for sharing it with us! Oh, such Beautiful things all around us! Yes, big thank you to Sugar for always helping us See Beautiful in all things. Very nice tribute. Oh no that's a kitty! What a whole bunch of beautiful!!! You are so right, the simple things of life in a loving family - that's beautiful!!! Those are all excellent beautiful things!